Therefore ones understanding and practice of Islam cannot be complete without a deeper knowledge of the previous Prophets and Messengers - especially Ibrahim (AS) and Musa (AS). Many Muslims think that the previous Prophets are for earlier nations and that they have nothing to do with us. However the reality is that they are a part of the development of the Millah and their stories are an essential part of our Religion. The Prophet Muhammad (SAW) himself was asked to follow and take lessons from the previous Prophets by Allah (SWT). What is essential for us from the previous Prophets is given to us in the Qur'an. Therefore Musa (AS) takes a central part in our Religion as his story is repeated in the Qur'an in many different ways, more than any other story. 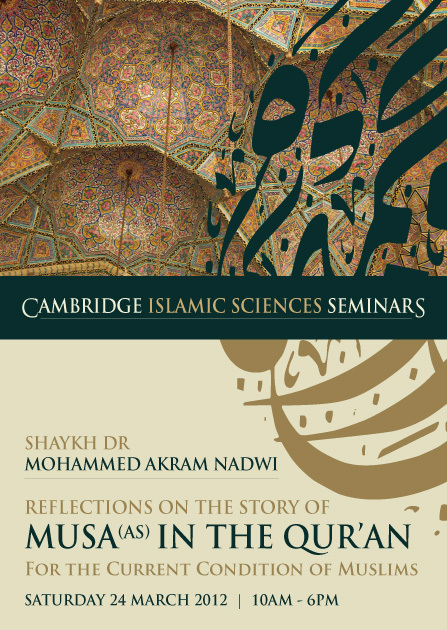 Here is the opportunity to have an in-depth understanding of how Musa (AS) built Islam, with deep reflections and scholarly insights from Shaykh Dr Mohammad Akram Nadwi. Reason & Revelation - What Is The Balance? Arab Spring or Muslim Spring?